Valley characterized by theater-shaped alcoves on Titan. Generally short and broad, deeply incised valley, which develops amphitheater-shaped heads. They display low albedo on brighter terrain. Low albedo of valleys is thought to be due to the accumulation of hydrocarbon residue in the valleys. Brighter terrain is thought to be composed of water ice with varying amounts of impurities presumably “washed clean” of hydrocarbons (Griffith et al. 1991; Perron et al. 2006). Sapping: On Earth, springs from subsurface water may erode loose sediment by underground seepage erosion, causing sapping (undercutting and failure of the ground surface), leading to upslope retreat and the formation of short, stubby tributaries with amphitheater-shaped heads and strong structural control of valley alignment and planform (Sapping Valley) (e.g., Schumm et al. 1995; Perron et al. 2006). 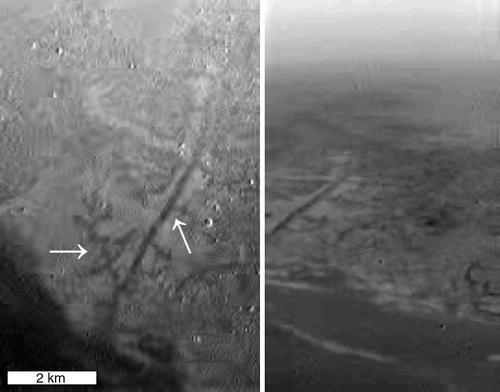 This process (methane spring sapping in water ice substrate) has been proposed for stubby drainage channel networks observed near the Huygens Landing Site on Titan (Tomasko et al. 2005). Sapping on Titan requires high amounts of subsurface liquids, “methanifers” (subsurface methane reservoirs) (Langhans et al. 2012*), which is suggested to be present from the observations of lakelike features (Stofan et al. 2007). Seepage erosion also requires horizontally layered material and poorly consolidated sediment to occur. In well-consolidated material, the material must be sufficiently susceptible to weathering, but even terrestrial cases are controversial for seepage erosion in consolidated materials (e.g., Lamb et al. 2006). Titan’s surface materials are thought to have high mechanical strength and low solubility in liquid methane that makes it unlikely that discharge from methane springs could weaken such substrate enough to allow seepage erosion to occur (Perron et al. 2006). Sapping and fluvial erosion: Seepage erosion of poorly consolidated material may be combined with fluvial erosion by liquid methane from precipitation, which erodes and transports water ice bedrock (e.g., Lamb et al. 2006). Dissolution erosion: Sapping as a primary valley-forming process is still more likely than dissolution erosion on Titan. Dissolution on Titan is possible but unlikely because the solubility of pure water ice in liquid methane or ethane at 94 K is very small. The solubility of pure ammonia ice in liquid methane at 94 K may approach the solubility of calcium carbonate in water on Earth, but there is no evidence of exposed ammonia on the surface (Perron et al. 2006*). However, closed polygonal-walled regions have been identified in more recent images interpreted as karst-like terrain (Malaska et al. 2010). Titan’s surface and shallow subsurface composition is unknown. The bedrock is most probably made of water ice but is thought to be coated by a large accumulation of photochemically produced hydrocarbon aerosols settling from the atmosphere, of unknown thickness, over geological timescale. Amphitheater-headed channels have been identified near the Huygens Landing Site (Fig. 1) and around 134°W, 50°N, which resemble deeply incised terrestrial canyons (Langhans et al. 2012). Valleys in the Florida Panhandle (Schumm et al. 1995).